CRABBE, Private, W, 632176. 20th Bn. London Regiment. Died of wounds 4th March 1917. Age 20. CRABBE, Private, W, 632176. 20th Bn. London Regiment. 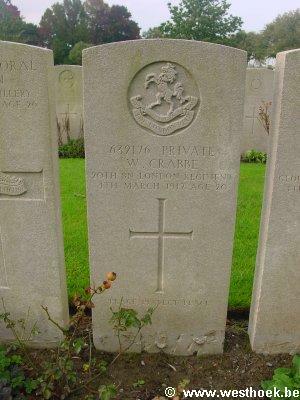 Died of wounds 4th March 1917. Age 20. An orphan boarded out to someone, unknown, in the Village of Penn, near High Wycombe, Bucks, from Dr. Barnado's Home. XI. B. 18A.